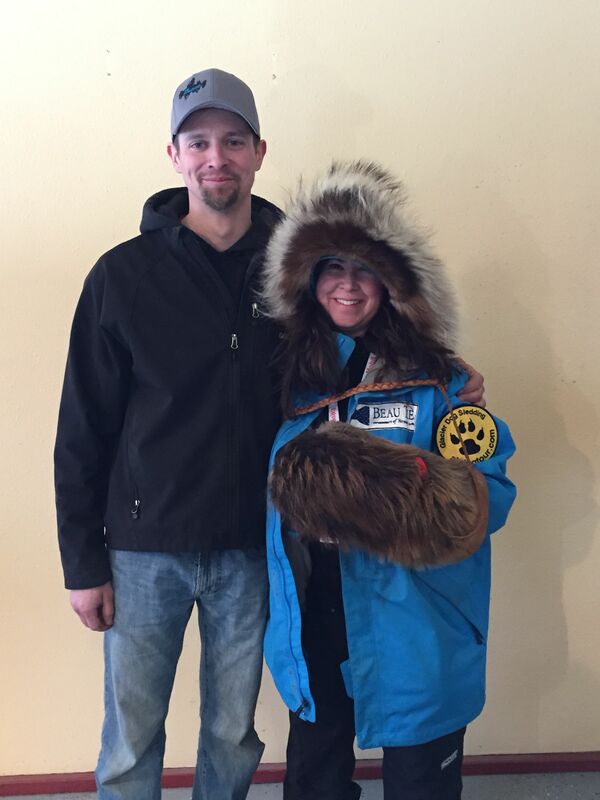 The 2016 Iditarod Teacher on the Trail™ with Matt Failor and his gear before the 2015 race. What is a parky? A parky is quite simply, the northern term for a parka. In the Aleutian Islands the word simply means “animal skin”. They are longer coats with a hood, usually lined with fur. Most are decorated with lovely fabrics and decorative trim. I remember seeing many parkys in the winter in Alaska, and wanting to know more about how these beautiful, and warm, traditional coats were made. In Alaska, one name resonates with traditional parky making, and by chance, it is very familiar! Laura Wright (no relation) was a famous native parky maker, and her shop is still on 4th Avenue in downtown Anchorage. Many people, including the famous Iditarod photographer Jeff Schultz, have smiled and asked me about the possible connection. Perhaps one day I can have my own parky made there! The last few years, I have been so fortunate to come to Alaska and attend two amazing Iditarod Educator Winter Conferences, and one Iditarod Summer Camp for Teachers, joined by dynamic educators from all over the country. These opportunities have inspired me to have such tremendous respect not only for the mushers, but for the work and organization behind the scenes that help build it and make it happen, year after year. I fondly remember being a finalist for the Iditarod Teacher on the Trail™ and traveling with the other conference attendees to Matt Failor’s home and kennel before the race start. He was gracious, funny, personable and spent a great deal of time explaining his trail gear and sharing trail stories with us all. Most mushers wear modern, synthetic parkas today. He generously allowed us all to try on his official Iditarod parka or parky and gloves, or mitts, and it was great fun. It enveloped me and my 5 foot tall frame! I asked Matt about his oversized otter skin gloves and why they were attached with a long, braided cord. His reply? “Do you want to lose your mitts on the trail in a blizzard?” Point taken, Matt! I was fascinated by it all, and I came away wondering how I could share this with my wonderful 4th grade students in the coming year: with a math lesson, of course! I called up my stepbrother Richard, a fellow Texan and graphic designer, and asked him for help. He graciously agreed and created a traditional parky image to not only use in my classroom but to share out with teachers all over! The parky he created is symmetrical, perfect for a math lesson. It is my passion to have art integrated in all areas of the curriculum, and this lesson also brings together math standards, a good book, and a little science too! 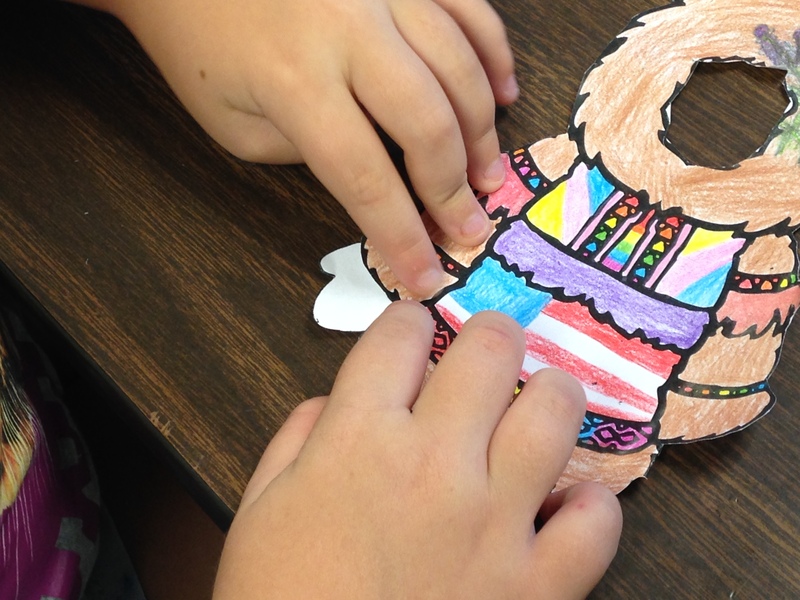 This lesson has several steps involved to make it to the finished product. I first spent some time talking to my students about the northern lights. I wanted a watercolor aurora borealis background for our parkys, so we researched all about them. I had fun sharing with my students about the nightly aurora borealis forecasts I found in the Anchorage Visitor Information Center. This is very different from Texas weather! In science class we are researching magnetism and energy, and this planetary phenomenon is the perfect example of both. My students were amazed to learn that the lights occur on other planets as well as Earth! We used 8 X 10 watercolor paper for our backgrounds, wet the paper, and painted the colors of the lights, including the famous eerie green that is so prevalent in this special Arctic light show. We added the adjective “eerie” to our student dictionaries for future reference. In our Reader’s Workshop we have been integrating our social studies standards with language arts. In 4th grade in Texas, we begin to study Native Americans not only from our state but from all over North America. We are currently reading the novel Naya Nuki: Shoshoni Girl Who Ran by Kenneth Thomasma, a piece of historical fiction about a little Shoshoni girl running away to find freedom. She uses her knowledge of traditional ways to survive in the wilderness. In the novel we have been learning more about the clothing of traditional native people: a perfect fit with this lesson in math. Terrie Hanke wrote a post during the 2015 Iditarod with wonderful pictures of the Inupiaq parkys from the community of Unalakleet. I found this post to be a great resource for this lesson. I did reduce the size of the original image to fit on top of our 8 X 10 watercolors, but a teacher can keep it full-size for a bulletin board decoration. We folded the parkys in half and held them up to the light to see the line of symmetry and check the congruent sides. Then, we decorated them and set them aside for our next step. We talked about the mukluks and mitts for our pictures. 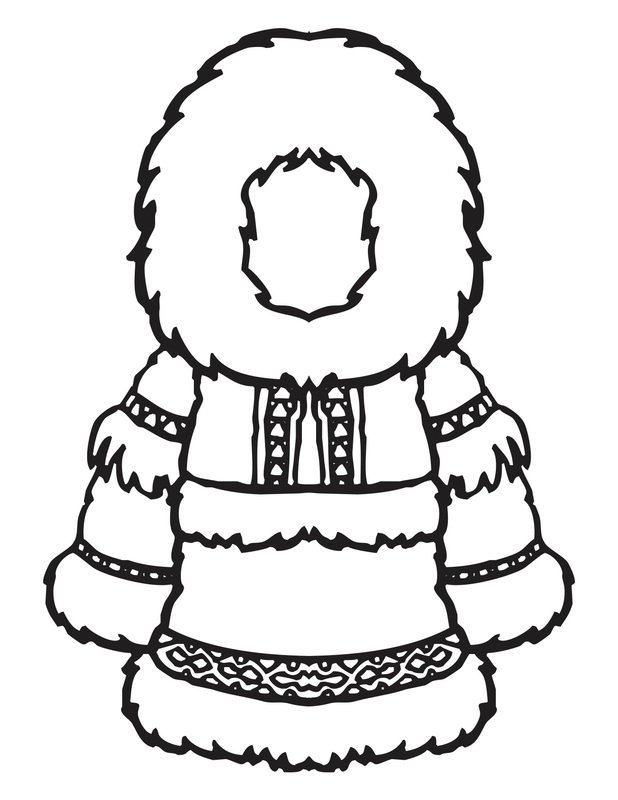 “What is a mukluk?” my students wanted to know! We love our cowboy boots in Texas, but my students had never seen anything like these! Since we have been learning about our Native Americans of Texas and their clothing, it was the perfect time to compare and contrast with traditional Arctic native clothing. 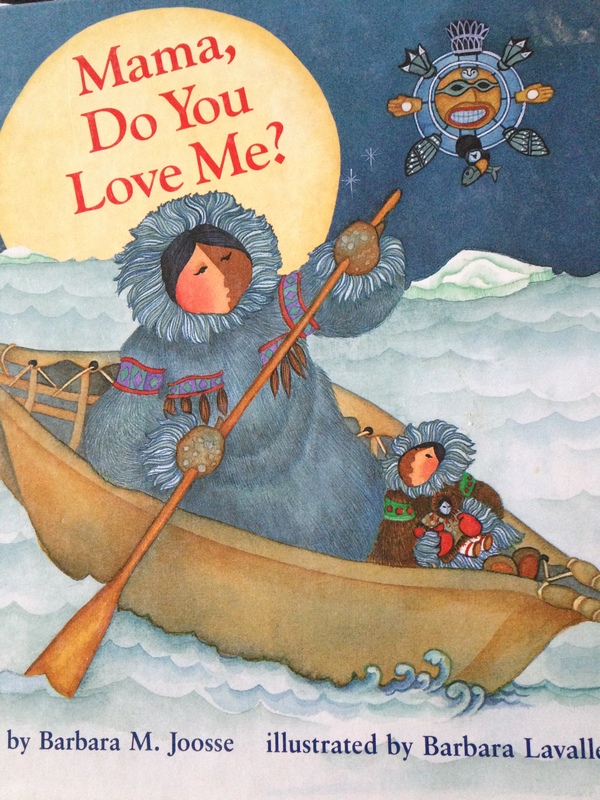 I read two simple picture books to my class to help with this lesson, Mama, Do You Love Me? 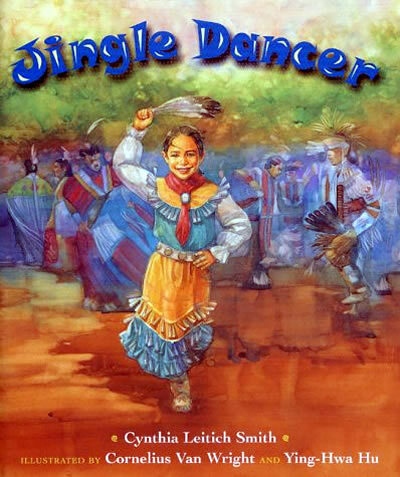 by Barbara M. Joose and Jingle Dancer by Cynthia Leitich Smith. For primary grades, these lovely pictures books are a great way to see clothing differences between traditional dress of Alaska Native Cultures and Native Americans from the southwest. I had the privilege of watching native dancers at the Alaskan Native Heritage Center this summer in Anchorage. I was inspired watching these young people celebrate their culture and share it with us. I was struck by their clothing, movement, and passion. Of course the weather, animals, and geography were factors in how Alaska Native Cultures and Native American tribes lived, and hunted, and clothed themselves. Traditional dress of people such as the Caddo of Texas included moccasins instead of fur skin boots. Why? They hunted buffalo, instead of reindeer and seal, and in the Texas heat warm, waterproof, fur lined boots were unnecessary! They certainly didn’t need fur mitts! My class brainstormed and discussed why, and we researched designs and patterns to create our own using our math skills. How else does this relate to the Iditarod? I shared a video with my class of the musher banquet in Anchorage two years ago when I came to the 2014 Iditarod Winter Conference for Educators with a group of teachers from Eanes Elementary. On the stage every musher pulled their starting order number from a traditional mukluk. 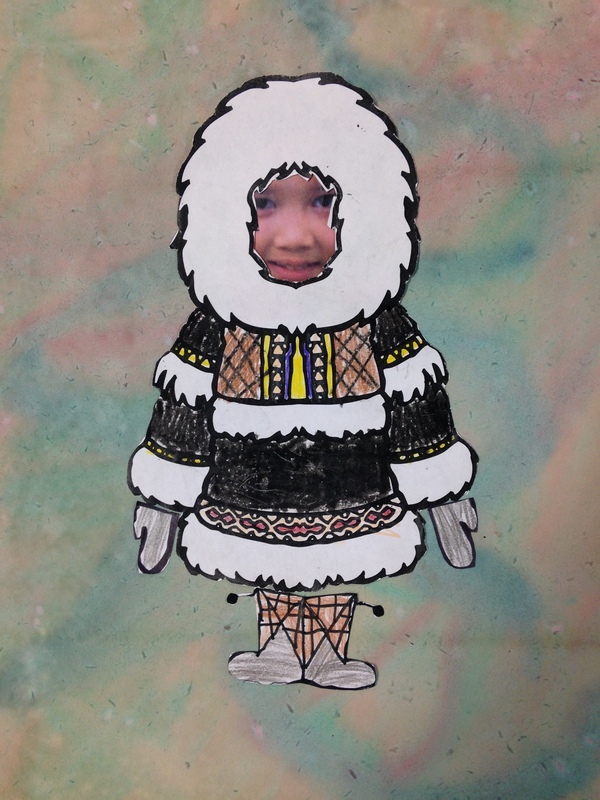 I put together a little movie of a few mushers we were following and rooting for in 2014, and my students loved the fact that the mukluk was used in this special way. The 2016 Iditarod Class – Ready for the Trail! Do you want see more lessons from the Iditarod Teacher on the Trail™? Check out the Iditarod Education Portal on the Iditarod site. There you can navigate lessons from all areas of curriculum and across grade levels. This is a great resource for any teacher! Are you interested in coming to Alaska for the 2016 Winter Conference for Educators? Find information and resources on the Iditarod site about this wonderful event in March!